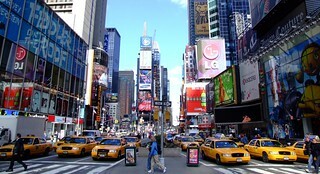 Times Square is a major commercial intersection and a neighborhood in Midtown Manhattan, New York City. It is located at the junction of Broadway (now converted into a pedestrian plaza) and Seventh Avenue, and stretches from West 42nd to West 47th Streets. Brightly adorned with billboards and advertisements, Times Square is sometimes referred to as "The Crossroads of the World", "The Center of the Universe", and the heart of "The Great White Way". In addition to being one of the world's busiest pedestrian intersections, it is also the hub of the Broadway Theater District and a major center of the world's entertainment industry. 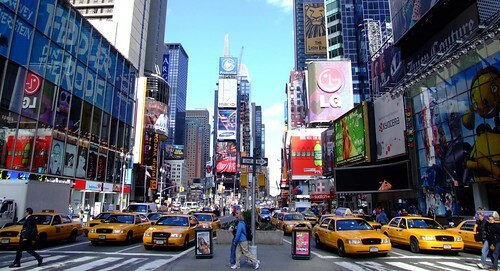 Times Square is one of the world's most visited tourist attractions, drawing over 39 million visitors annually. Approximately 330,000 people pass through Times Square daily, many of whom are either tourists or people working in the area. Formerly Longacre Square, Times Square was renamed in April 1904 after The New York Times moved its headquarters to the newly erected Times Building (now called One Times Square). That building is the site of the annual ball drop on New Year's Eve, which began on December 31, 1907, and continues today, attracting over a million visitors to Times Square every New Year's Eve. When Manhattan Island was first settled by the Dutch, three small streams united near what is now 10th Avenue and 40th street. These three streams formed the "Great Kill" (Dutch: Grote Kill). From there the Great Kill wound through the low-lying Reed Valley, known for fish and waterfowl and emptied into a deep bay in the Hudson River at the present 42nd Street. The name was retained in a tiny hamlet, Great Kill, that became a center for carriage-making, as the upland to the south and east became known as Longacre. By 1872, the area had become the center of New York's carriage industry. The area not having previously been named, the city authorities called it Longacre Square after Long Acre in London, where the carriage trade in that city was centered and which was also a home to stables. William Henry Vanderbilt owned and ran the American Horse Exchange there until the turn of the 20th century. As more profitable commerce and industrialization of lower Manhattan pushed homes, theaters, and prostitution northward from the Tenderloin District, Long Acre Square became nicknamed the Thieves Lair for its rollicking reputation as a low entertainment district. The first theater on the square, the Olympia, was built by cigar manufacturer and impresario Oscar Hammerstein I. "By the early 1890s this once sparsely settled stretch of Broadway was ablaze with electric light and thronged by crowds of middle- and upper-class theatre, restaurant and cafe patrons. Times Square is the most visited place globally with 360,000 pedestrian visitors a day, amounting to over 131 million a year. As of 2013, it has a greater attendance than do each of the Disney theme parks worldwide, with 128,794,000 visitors between March 2012 and February 2013, versus 126,479,000 for Walt Disney World attractions in 2012. Times Square – 42nd Street / Port Authority Bus Terminal is a large New York City Subway station complex located under Times Square and the Port Authority Bus Terminal, at the intersection of 42nd Street, Seventh and Eighth Avenues, and Broadway in Midtown Manhattan. It is the busiest complex in the system, serving 63,617,614 passengers in 2013. C and R trains, and the 42nd Street Shuttle at all times except late nights. When it first opened in October 1904, Times Square was a local station on New York City's first subway. Three shuttle tracks have served it since 1918; the southbound express track was removed and replaced by a temporary wooden platform for access to the original northbound express track. On both sides platforms are located (at the old local platforms) and where the southbound express track was; all three platforms connect on the west (railroad north) side. This walkway crosses the northbound local track on a bridge that can be lifted for the only access to that track, via a merge into the northbound IRT Broadway – Seventh Avenue Line local track along the original subway alignment (north of the current Broadway – Seventh Avenue Line station). This track merge is only used for overnight swaps and special railfan excursion trains. The other three tracks once curved parallel to this. Two of the three tracks end at bumper blocks at the west end of the platforms. Between the northbound local and the other tracks anywhere along the shuttle there is no track connection. Because of the curvature on the platforms, gap fillers are used to bridge the gap between train and platform; however, the gap fillers are not suitable for wheelchair passengers, making the shuttle platforms virtually inaccessible to wheelchair users. Such passengers who need service to Grand Central must use the IRT Flushing Line platforms. An underpass that used to connect the original side platforms lies between the downtown local track and the other three tracks of the BMT Broadway Line, which runs perpendicular to the shuttle. Tracks 1 and 3 have gap fillers. Track 4 does not have gap fillers because of the convex curve of the platform. Track 4 can barely fit the three cars of the shuttle; it originally ended at a wall but now has a small extension for alighting passengers, so the last pair of doors of the train on the platform can only have one panel open for safety. Track 3 can accommodate trains with four cars as well as space for half a fifth.